There are a vast array of synthetic chemical-laden hair products available in the beauty aisles of supermarkets, many of which claim to perform wondrous feats on your hair. However, many of the ingredients in these hair care products - particularly in the case of shampoo and conditioner - can actually be irritating and harmful. Why Make Your Own Natural Hair Products? The ingredient Sodium Lauryl Sulphate is one such example. 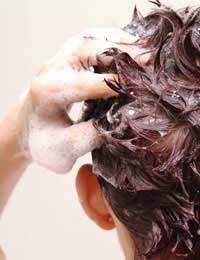 It is one of the most common ingredients found in shampoos and conditioners, due to its foaming properties. However, worryingly, studies have suggest that Sodium Lauryl Sulphate could be responsible for causing problem with eye development in children and cataracts in adults. It is also known to strip oil from the surface of the skin leaving it pitted and rough, as well as corroding hair follicles. And when you consider how many ingredients are in your average hair care product, you may realise why switching to a homemade natural hair products is the safest and more eco-friendly solution. You will then need to use the shampoo base in your main recipe, where essential oils are added. You can also incorporate fresh herbal ingredients, such as lavender or peppermint into your shampoo recipe. To extract the oils from the herbs, you will need to add the herbs to half a cup of water and gently bring to the boil, before adding to your shampoo and glycerin. The shampoo will need a few days to thicken before being used, and should be stored in an airtight recycled old shampoo bottle. Another addition to your natural hair care product range is to make your own hair conditioner. One popular homemade recipe is to simply use mayonnaise as a conditioner. However, sometimes this can cause a rather strong vinegar smell to linger in your hair between washes. You can combine the mayonnaise with avocado - at a ratio of one avocado per small jar of mayonnaise - to create a conditioner. The avocado should be peeled, the pit removed and the flesh worked in with the mayonnaise by hand. The mixture can then be applied to your hair, and cling film wrapped around the hair for a truly deep conditioning treatment. If your hair is particularly dry or damaged, wrapping another layer of towel around the cling film will help the conditioning treatment to penetrate even further. Another natural alternative is to use half a cup of water mixed with half a cup of honey. This can be applied directly onto the hair and left for around quarter of an hour, before being rinsed off. You may find that you need to rinse your hair twice or more to remove all traces of the honey - however, your locks will be left looking shiny and feeling soft once the hair has dried.